Pancakes are back on the menu! About a month ago I reached out to my fellow stomachless friends about some breakfast ideas that wasn’t oatmeal or eggs. I learned that they all could eat pancakes. I was both shocked and excited with this information. I had been avoiding pancakes for the past year because every time I ate them, I would end up feeling ill and falling asleep. Steve suggested I try birch benders paleo pancake mix. Sadly, we quickly learned that they cannot ship to Canada so I resorted to pintrest to find a paleo pancake recipe. Low and behold, I found one and have been eating them every weekend. The biggest difference was that it used almond flour instead of regular flour. I also found a great waffle recipe using the same principle. I haven’t been bold enough to put my usual peanut butter or syrup on them yet but I have put chia seed blueberry jam on them and have been fine. Needless to say, I have been eating pancakes every weekend since this new discovery. The almond flour can be more expensive but it’s totally worth every penny. Pancakes and Waffles are back on the menu! 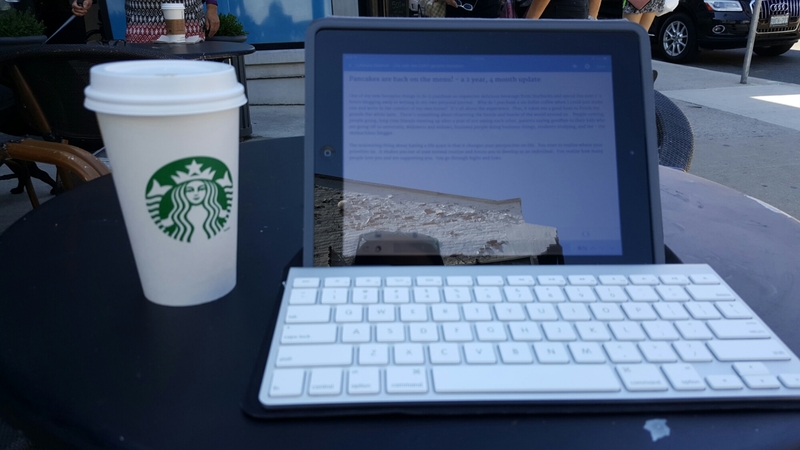 One of my new favourite things to do is purchase an expensive delicious beverage from Starbucks and spend the next 1-2 hours blogging away or writing in my own personal journal. Why do I purchase a six dollar coffee when I could just make one and write in the comfort of my own home? It’s all about the experience. Plus, it takes me a good hour to finish my grande flat white latte. There’s something about observing the hustle and bustle of the world around us. People coming, people going, long time friends meeting up after a year of not seeing each other, parents saying goodbye to their kids who are going off to university, widowers and widows, business people doing business things, students studying, and me – the stomachless blogger. The interesting thing about having a health scare is that it changes your perspective on life. It forces your to slow down and evaluate where your priorities lie. It shakes you out of your normal routine and forces you to develop as an individual. You truly understand how many people love you and are supporting you. I realized that everyone is writing their own story that I may know nothing about. Maybe that’s why I have taken a new love to hanging out in coffee shops.